More intensification in the Bayview/Sheppard area. I believe this is site is by Phantom Developments. Properties are still owned by 4 different owners. Anyone else with more information? You laugh at me because I'm different--I laugh at you because you're all the same. Well!! that take long to covert those single homes north of Jade development into this development. I was sure when I first saw the area that area was history with the Java development plan on the north side and Twenty One Clairtrell to the west. 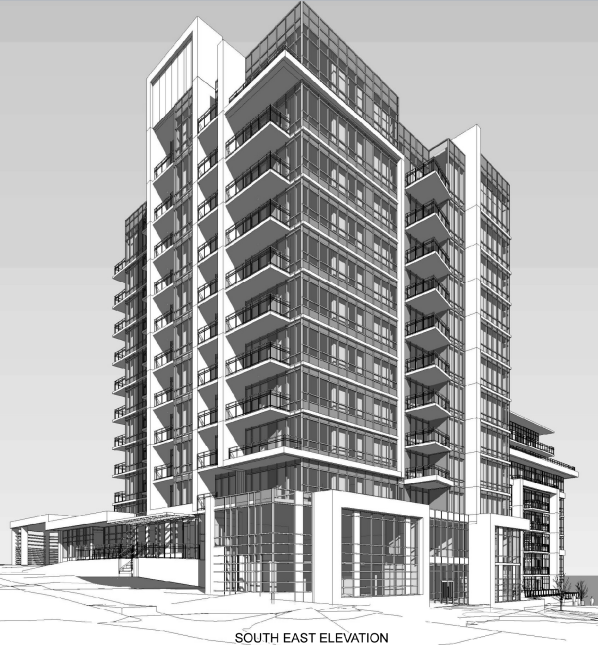 14 storey with 144 units. 10 Teagarden Court will become a park and assuming the single standing house for Jade will be part of this part also, since the houses are gone a a big hole in the ground. Looking at the plan for this development, only the north section of the court is being develop, leaving the west end and south remaining. The house between the tower and park is staying. Either the owner wasn't selling, wanted too much or there is agreement to allow them to live there until they die. If it is the last one, then this property will become another section to the park. If they held out for more money, it going to be hard to sell this house down the road. Its just like the house on the corner of Bayview & Spring Garden Ave, which now has this development south of it and Jade west of it. 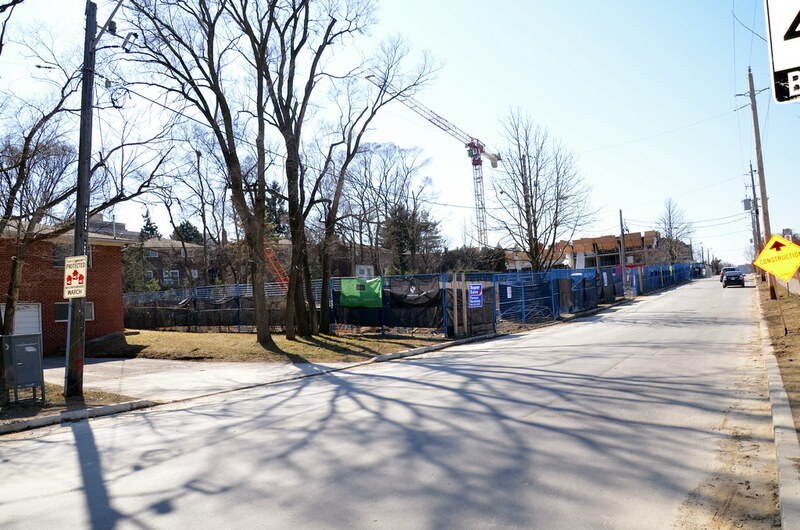 One can assumed that the remaining houses on the court will become parkland, as there not enough room for another tower unless the church sells their parking lot with provision for underground parking. 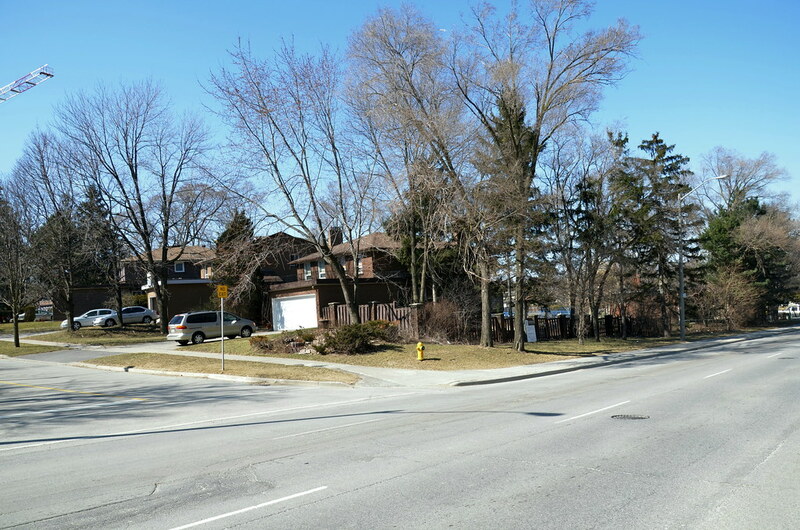 The Bayview and Sheppard area is a good example of the difficulty of densifying already built-up suburban areas. I like the fact that they are attempting to replace an automobile-oriented built form with more high density, but it's a slow, arduous process as we wait for holdout homeowners. As a result, the area kind of looks like a dog's breakfast with midrises and highrises jostling with 50s and 60s bungalows on wide lots. Even the sidewalk is kind of erratic: one minute it's this wide, landscaped spread in front of a condo project, the next second it's a drainage ditch that looks like something in Keswick. The "urban" parts of Atlanta have a similar look/feel. Well there doesn't seem to be any other way to go about it. Have to start somewhere I suppose. Plus, I'd argue that a slow process (over decades) would allow for a nice evolution consisting of different architectural styles and build forms, which is certainly a plus. The other option is eminent domain/expropriation. While this is a slippery slope, if all the remaining homeowners have sold and left and there is one person holding out that jeopardizes the development, paying market rate for compensation and telling them to leave is fair. However, to justify expropriation you would have to argue that some kind of public good will come from this. Perhaps the developer could seal the deal with providing a certain percentage of affordable housing units, on top of streetscaping and community amenity improvements...then there's always the argument that you're densifying near transit. I think the different building styles from different eras argument is more valid in the downtown core where, regardless of the age of the buildings, they are all more or less urban. In this case, we are talking about bungalows from the 1960s - which are neither rare nor do they suit the needs of the area (increased density near expensive, once-in-a-lifetime subway projects). I'm assuming Xray is talking about architectural and built form variety in the new developments replacing the bungalows; an evolution excluding the bungalows. If multiple blocks were all bought and razed and developed together by one firm, you get CityPlace, you get NY Towers, etc. If the mega-project's design hits, it's a big hit, but if it misses, it's a big miss...a big mess. If the area is developed a few lots at a time with holdouts interspersed, there's the hope that stretching out the redevelopment process and ensuring different firms are involved will result in variety and a healthy degree of organic randomness rather than the same precast + glass condo over and over like a Tom & Jerry cartoon. And it's not even a hope, really. It happens. Even looking just at CityPlace shows that ~15 years of time, changing tastes, and slow urban design policy shifts can morph a 'unified' complex as it gets built, let alone a neighbourhood with no unifying force guilding the development. Maybe such holdout lots could become really cool little infill projects one day. The alternative is a hyper-bland, oppressive, block-long amenities podium with a point tower on top. It's not about keeping the bungalows - they will all be torn down before you know it. 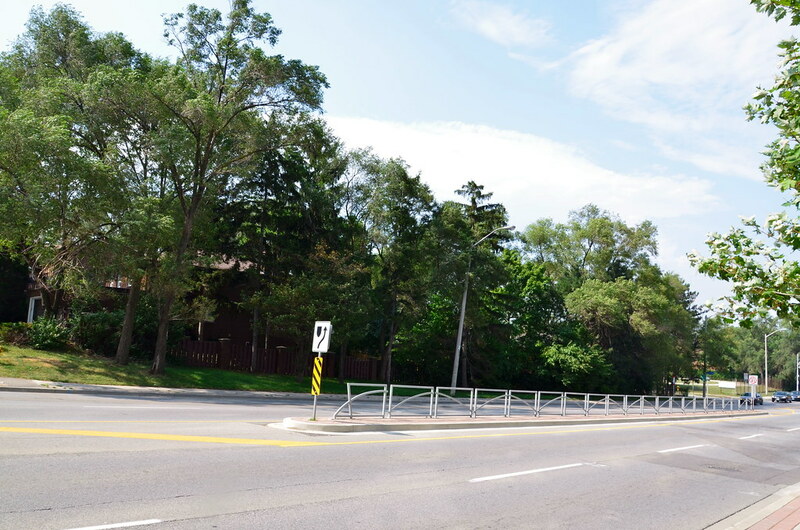 What is happening at Bayview and Sheppard is far more sustainable in the long-run. These many smaller boutique condo buildings (i.e. Jade, NY Place, TwentyOne Clairtrell) all by different developers will age much better over the next 10-20 years than a couple mega-sized condo complexes would. There are some smaller-scale commercial developments happening in this area too. Slow and incremental growth is a far more 'urban' and resilient development pattern than a couple mega-projects by one developer. Now coming to market as Tea Garden Condos. Front page story here. This development won't include the lot at #10, saved for a future redevelopment. 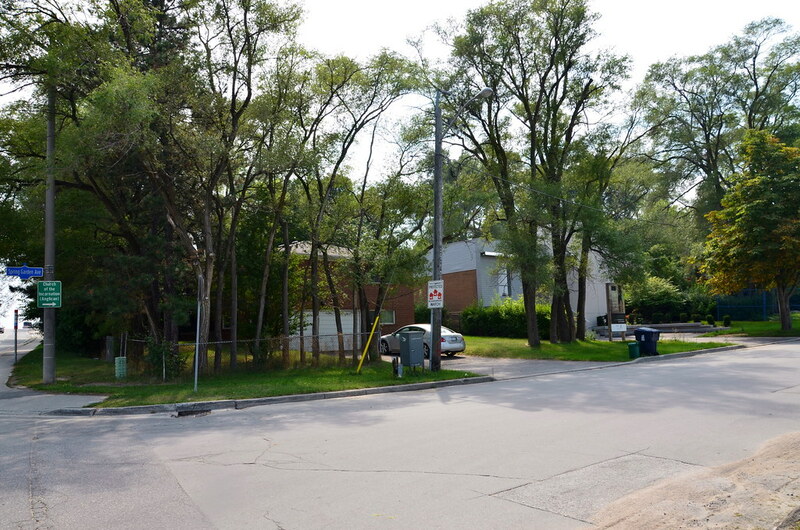 The building is bland and uninspiring but this is good infill for the area. The smartest thing they did was to save lot 10 for another development. Turning it into a park, as previously envisioned, doesn't make any sense or provide much for the area. The sign said 80% sold and the first 2 houses by Bayview are empty. Some hording up on Bayview. One hope various shrubs can find a new home or be save for the site landscaping as they are too nice to throw one. The lost of those trees will be a shame, but too big to move them.